Trust shade sails in Darwin made of Rainbow Shade fabrics for superior protection! Darwin experiences distinct dry and wet seasons, with temperatures remaining similar all around the year. As such, shade solutions that offer protection from the sun and the rain are in heavy demand. While shade sails are great in this regard, most hardware stores only offer lesser grade products. You should only buy shade sails in Darwin from reputed manufacturers, who use Rainbow Shade fabrics. Rainbow Shade is an Australian owned and operated company that supplies premium shade fabrics to shade sail manufacturers in Darwin, and the rest of Australia. Our products are specifically designed to withstand Australia’s weather conditions and Darwin in particular. Not only do our fabrics offer excellent protection from the sun’s UV rays, but they also withstand strong rain and heavy winds. For over 25 years now, we have been supplying shade fabrics to manufacturers of shade sail in Darwin. Unlike other shade fabric suppliers, we do not offer a broad product rage. Rather, we focus on offering the best shade fabrics for all-weather protection. When it comes to waterproof shade sails in Darwin, you will not find any better than those made out of Mehler. Comprised of special PVC material, this fabric is water resistant and UV rated as well. Designed to offer superior stability and strength, the Mehler range won’t lose shape over time. In fact, it will withstand the toughest of weather conditions with ease. You’ll see this fabric being extensively used in commercial applications in Darwin. eXtreme 32 is our fabric of choice for use in commercial shade sails in Darwin. This fabric is incredibly strong and features high tear resistance. Moreover, it offers great UVR protection of up to 95.8%. As a fire rated fabric which is designed for easy maintenance, eXtreme 32 is also exceptionally stable. In Darwin, this eXtreme 32 is commonly used in large shade sail applications, including commercial car parks, kindergarten and school playgrounds and to provide shade over swimming pools. DRiZ is widely used in both commercial and residential shade sails in Darwin and is our second offering for manufactures of waterproof shade sails. This fabric is extremely lightweight, making it easy to maintain and install. Furthermore, DRiZ features a waterproof coating and it offers unmatched UVR protection of up to 100%. 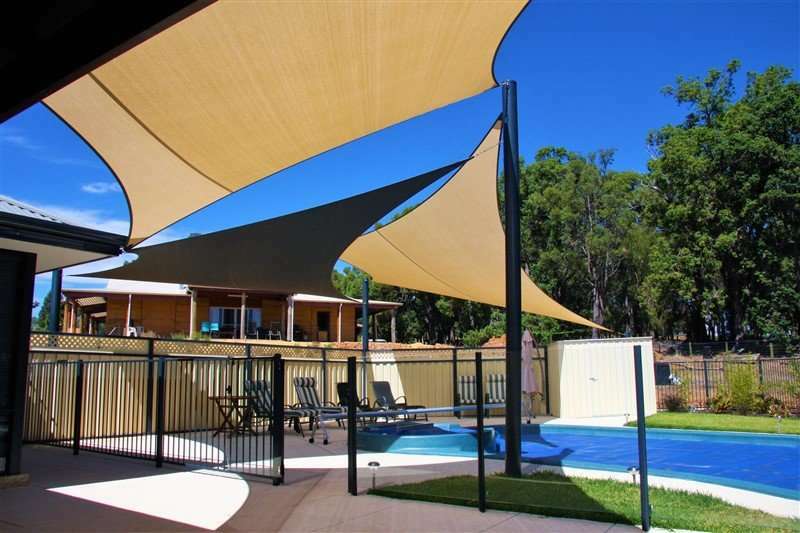 You will find shade sails made out of DRiZ being used in commercial establishments, large shade structures, residential homes, schools and many other applications across Darwin. Finally, the most popular fabric used for shade sails in Darwin is Z16. This product is the base to our DRiZ fabric, Z16 offers the same merits, but it isn’t waterproof. The reason customers prefer this fabric is because it is available in a range of 22 colours. As such, Darwin shade sail manufacturers are able to create wonderful designs by using this fabric for their shade sails. All Rainbow Shade fabrics are tested to meet Australian standards of quality. Moreover, we also back our products with warranties ranging from 5-20 years. It’s no wonder that we’re the preferred partner for shade sail manufacturers in Darwin and other parts of Australia. Why choose shade sails in Darwin that use Rainbow Shade fabrics? At Rainbow Shade, we have been supplying quality shade fabrics to shade sail manufacturers for over than 20 years. The excellent quality of our product is backed by our reputation of being the leading shade fabric supplier in Australia. By choosing shade sails in Darwin that are made out of a Rainbow Shade fabric, not only will you receive excellent UVR protection, but by choosing DRiZ or Mehler, you can also benefit from all-weather protection. Shade sails made out of our high-quality fabrics can last 10 times longer than the typical shade sails that you’ll find at your hardware store. There really is no reason to choose an inferior product – request that your shade sail manufacturer use only Rainbow Shade fabrics. We supply our shade fabrics across Darwin. If you live in Alawa, Anula, Bayview, Berrimah, Brinkin, Buffalo Creek, Casuarina, Coconut Grove, Coonawarra, Darwin, East Point, Eaton, Fannie Bay, Holmes, Jingili, Karama, Larrakeyah, Leanyer, Lee Point, Ludmilla, Lyons, Malak, Marrara , Millner, Moil, Muirhead, Nakara, Nightcliff, Northlakes, Parap, Rapid Creek, Sanderson, Stuart Park, The Gardens, The Narrows, Tiwi, Wagaman, Wanguri, Westbourne Park, Wingfield, Winnellie, Woolner or Wulagi, you can rest assured that there is a partnering shade sail manufacturer close by. Simply give us a call and we’ll connect you to a Rainbow Shade partner today!